My name is Andrea Tomlinson, I have been General Manager of NH Community Seafood, since March 2015. I attended the University of Miami and then transferred to UNH where I graduated with a BS degree in Marine Science. I have been working in the field of Marine Science for over twenty five years. My employment in NH has included the UNH Jackson Estuarine Lab, the UNH Coastal Marine Lab and Great Bay Aquaculture (GBA was the only commercial marine fish hatchery in the US), where I began my career in finfish aquaculture. Drawn to philanthropy, I spent my post-graduate years doing community development volunteer work in rural Jamaica and later moved on as Nursery Manager on one of the largest and most successful tilapia/freshwater shrimp farms on the island. With this experience, I started my own seafood distribution business in Jamaica, delivering locally grown shrimp and fish to Jamaican-owned seafood restaurants and hotels. I soon realized that selling local seafood was not only a form of income, it was a passion! In 2002, I moved back to New Hampshire and eventually back to aquaculture at GBA, in Portsmouth. Here, I was both Broodstock Manager and held an administrative managerial role and started to work in sales. With the unfortunate closing of this facility in 2012, it was time to get creative with my second passion, organic farming. Having grown organic chickens for the prestigious Farm to Table restaurant, Blue Moon Evolution in Exeter as a part time hobby, this became a full time endevour. I am a true supporter of the local food movement and keeping NH grown food and fish in NH! I believe in these times of over industrialization and a lack of understanding about where our food originates, we need to revisit the logical purchasing practices of our foreparents and buy our food from people we know, close to home! 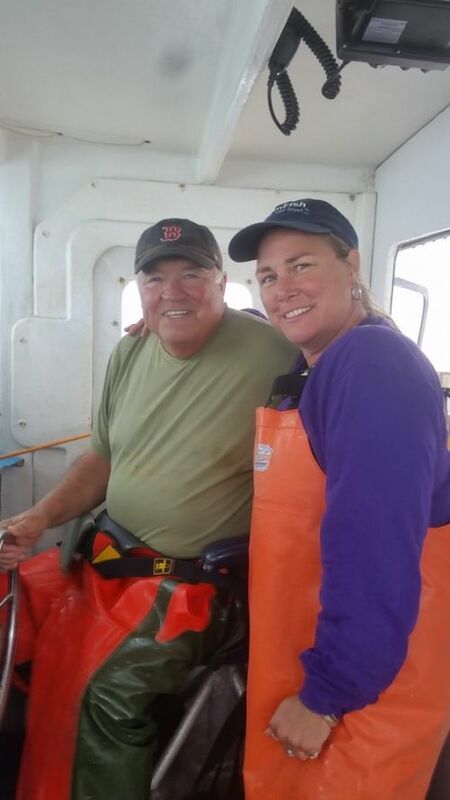 I enjoy working our Local Fishermen, Lobstermen and Oyster Farmers and the processors and customers of this thriving Community Supported Fishery! And with the forward thinking Chefs throughout NH and southern Maine that I work with in our Restaurant Supported Fishery! We are growing each year and plan to continue our progress while supported a larger variety of fisheries here, locally! Enrica came to the United States from her native Switzerland in 2013 to study Marine Biology at the University of New Hampshire. Through her studies and her love for good, local food, she became interested in sustainable aquaculture and fishery. Motivated by this, she was part of the founding group of the UNH Sustainable Fisheries and Aquaculture Club. With the club, she helped organize the Annual Seafood Cook-Off for the university. After graduating, her love for the ocean did not diminish, and she stayed right in the Seacoast. In 2019, she joined NH Community Seafood as Assistant Manager, and is hoping to build strong connections in the restaurant industry, and generate more wide-spread support for our local fisheries. When she is not in the kitchen, or trying out a new restaurant, you may find her helming a sailboat in Boston Harbor, or casting her fishing rod along the shores of Martha's Vineyard. Josh Wiersma and Sarah VanHorn co-founded NH Community Seafood in 2013. Sarah now resides in the Virgin Islands and is sadly missed. Josh resides in Massachusetts with his family and works for the Environmental Defense Fund (EDF) in Boston. We partner with Brookford Farm for several of our pick-up locations. Often times members of the CSA will also become members of our CSF. We are grateful and appreciative of the entire staff at Brookford Farm and thank them for their support! Brookford Farm is a diversified organic farm, located in Canterbury, NH that offers nutritious food for your entire diet.